The GODEX barcode printer offers the largest media and ribbons capacities in its class. Unlike most printers, it can easily handle both a 300-meter ribbon and a full 8-inch OD roll of labels. With its fast print speed, along with the largest memory capacity in its class, GODEX printer is ideal for customers looking for a high quality bar code printer, coupled with low ownership costs. GODEX printer is competitively priced, comes with a two-year warranty, and accommodates a 300-meter-long ribbon, which keeps both daily and lifetime operating costs lower than other comparable printers. GODEX label printers are available in as either direct thermal only or thermal transfer or direct thermal configurations. Our models that are designed for thermal transfer printing can be run in direct thermal or thermal transfer mode. Direct thermal mode uses heat sensitive labels that darken to form barcodes, graphics and printed text as heat is applied by the printer’s print head. Direct thermal labels are suitable for short shelf life labels which are not exposed to extreme light or heat. And GODEX label printer also called a GODEX Thermal Label printer. GODEX EZ1100 DESKTOP LABEL PRINTER OFFERS BEST-IN-CLASS SPEED AND HIGH-RESOLUTION CAPABILITIES, ALONG WITH A RUGGED, RELIABLE DESIGN. GODEX G 500 LABEL PRINTER DELIVERS PREMIUM PERFORMANCE FOR INDIAN BARCODE CORPORATION IN INDIA. GODEX RT 700 OFFERS A VARIETY OF OPTIONS, INCLUDING A ROTARY CUTTER, KEYBOARD DISPLAY UNITS, A LONG RANGE LINEAR IMAGING BARCODE SCANNER, AN SD CARD READER SLOT, A BLUETOOTH MODULE, A 3-INCH-CORE LABEL SPINDLE AND AN EXTERNAL LABEL HANGER FOR THE GODEX RT 700 MODEL. GODEX G 300 DESKTOP THERMAL BARCODE PRINTER, LABEL WITH ITS NEW, SMALLER FOOTPRINT, OFFERS THE HIGH PERFORMANCE THAT CUSTOMERS HAVE COME TO EXPECT FROM GODEX. GODEX EZ520 FEATURES A USER-FRIENDLY CLAM SHELL DESIGN FOR EASY DROP-IN MEDIA LOADING, ALONG WITH A RUGGED DOUBLE-WALL DESIGN THAT IS STRONGER AND MORE DURABLE THAN OTHER THERMAL TRANSFER MECHANISMS ON THE MARKET. Indian Barcode Corporation offers a large selection of compatible thermal transfer ribbon for barcode printers. Our expertise is our ability to help you reduce costs while delivering top quality ribbon within short lead-time. GODEX Printers Wax Ribbons are extremely versatile and can be used with a wide range of paper media – from vellum to coated labels. They are noted for their exceptional sensitivity and density and feature a back coating that ensures optimal print head protection. GODEX Printers high-efficiency Wax-Resin Ribbons are designed for use in dozens of applications and are specially tailored for printing on coated labels or synthetic surfaces. GODEX Printers high-tech Premium Resin Ribbons are designed for extremely demanding bar code applications. They are ideally suited for printing on synthetic materials, including textile bases, and are highly resistant to abrasion, temperature, solvents and purifiers. Indian barcode Corporation a proprietorship since 1997 is the world’s leading barcode solution provider and RFID labeling solutions Provider. Indian Barcode Corporation now establishes a worldwide network to supply the material. Indian Barcode Corporation deals in all kinds of Argox Barcode Printers Price India, scanners the Barcode Products for the custom products and many other portfolios. We Indian Barcode Corporation (http://www.indianbarcode.com) are the authorized Distribution Partner with ARGOX to distribute the ARGOX barcode printers price India, Scanners and other consumables across India. We have an Efficient team to develop the software accordingly to the SDK provided. Indian Barcode Corporation meets the regulatory and compliance standards, improve customer responsiveness, increase operational and supply chain efficiency, brand consistency and protection, We Indian Barcode Corporation focus on adding value to your business with the quality of the material and our service. We are Global Manufacturers and take vanity in the variety of our products and our ability to deliver with the fast, dependent, flexibility with all areas and responsible so often demanded in today’s business environment. Indian Barcode Corporation deals in all the Products of the ARGOX and the consumables and provides the service for the ARGOX as an authorized service partner. Our main focus is on the ARGOX Barcode Printers to satisfy the needs of the end users of the Retail sector, Shopping complex, Chemical Industries, chemical factory, Pharmaceutical Industries, Packaging Industries and many more. ARGOX Barcode printers are basically of two types, one is Desktop Label printer and second the Industrial Label Printer. Desktop Label printers are used for the small scale and the Industrial printers are used in the large scale industries. Both types of the printers are further divided into direct thermal and the Thermal transfer Printer. In case of the direct thermal printer the head directly gives the impression on the paper roll and in this way the paper is printed. But in case of the Thermal Transfer Label printer a Ribbon is there which gets melted by the head when comes in contact with the head and the text gets printed on the paper roll. We have our service center to provide the offsite service for the ARGOX Barcode printers and each and every consumable of the ARGOX Labels printers are always there in our stock. The Print Head for ARGOX Label Printer, ARGOX ribbons, Direct Thermal Labels for ARGOX barcode printers price India, Thermal Transfer labels for the ARGOX printers can be purchased from us any time. You can also buy the ARGOX Printers and consumables online from our online portal www.indianbarcode.com. We are also the manufacture of the Labels for the ARGOX printers and a large number of the standard size labels are always there in our stock and special size labels can be manufactured on the orders instantly. The CP-3140L/CP-3140LE compact desktop printer offers 300dpi resolution and larger memory for high quality printing. The high print resolution is perfect for producing text and graphics for applications such as clothing labels, photos on hospital I.D. bracelets, and labels for small retail items such as jewelry. The CP-3140 L/ CP-3140 LE holds a 300 M long ribbon for large printing demands and for less frequent ribbon changes. Loading media and ribbons is quick and easy. A paper sensor system supports diverse media and you can select ribbon ink-side in or ink-side out. Four auto calibration modes deliver more precise printing. The printer provides multiple communication interfaces including parallel, RS-232, and USB ports. The new CP-3140 L/ CP-3140 LE printer is space-saving, flexible, and delivers outstanding print performance. Supports 1 D/GS 1 Data bar, 2 D/Composite codes and QR barcodes, and windows true type font download available. The compact CP-2140 desktop printer not only saves space, it lets you install a large 300M long ribbon for bigger printing demands. Ribbons and media are easy to load, and you can select for ribbon ink-side in or ink-side out. A media sensor system delivers greater flexibility for diverse media and applications. A head-open switch initiates auto-calibration for more precise printing. Multiple communication interfaces include parallel(CP-2140), RS-232, USB, and optional Ethernet(CP-2140E). The CP-2140 prints at 203dpi resolution and a speed of 4ips. Standard memory includes 4MB Flash and 8MB SDRAM. The printer has a modular design for easy maintenance, and printing noise is minimal. It supports the Windows 7 OS, 1D/GS1 Data bar, 2D/Composite codes, QR barcodes, and Windows TrueType fonts. of a large printer and at a more competitive cost. It’s the perfect printer for applications such as clothing tags, self-labeling, mailing, retail, shipping & receiving, inventory and patient tracking. The new CP-2140 and CP-2140 E printers continues Argox’s leading position in innovation, price, and performance. The compact CP-3140 desktop printer not only saves space, it lets you install a large 300M long ribbon for bigger printing demands. Ribbons and media are easy to load, and you can select for ribbon ink-side in or ink-side out. A media sensor system delivers greater flexibility for diverse media and applications. A head-open switch initiates auto-calibration for more precise printing. Multiple communication interfaces include parallel(CP-3140), RS-232, USB, and optional Ethernet(CP-3140E). The CP-3140 prints at 300dpi resolution and a speed of 4ips. Standard memory includes 4MB Flash and 8MB SDRAM. The printer has a modular design for easy maintenance, and printing noise is minimal. It supports the Windows 7 OS, 1D/GS1 Data bar, 2D/Composite codes, QR barcodes, and Windows TrueType fonts. of a large printer and at a more competitive cost. It’s the perfect printer for applications such as clothing tags, self-labeling, mailing, retail, shipping & receiving, inventory and patient tracking. The new CP-3140 and CP-3140E printers continues Argox’s leading position in innovation, price, and performance. The G-6000 offers the industrial standard 6 inch width to give you high speed performance and greater extension of the printing area. Built-in LCD display, 2 MB flash memory, PS/2 interface for your PC keyboard provides the essential structure for Plug and Play stand-alone operation. Perfectly designed metal case resists rough treatment, heat, and dust, and ensures continuous quality operation, even in the most demanding environments. Superior historical control enhances high printing quality, and is perfect for printing of barcode and small alpha numeric. The G-6000 is simple to operate and it is easy for the user to perform adjustments and maintenance. The new X-1000 VL industrial barcode printer offers outstanding performance and value in an all-metal housing well-suited for harsh environments. A 32-bit RISC microprocessor provides print speeds up to 4 ips, which is ideal for medium-volume printing requirements. The 4 MB Flash memory and 8 MB SDRAM ensures smooth operation and high reliability. The X-1000 VL printer is flexible, easy-to-use, and offers value and high performance printing for industrial environments. The versatile new X-2000 V industrial barcode printer features “stand-alone” operation using a standard PS/2 interface for connecting a PC keyboard or scanner for data input—no extra cost for KDU or printer controller is required. A multilingual LCD display on the front panel makes installation, configuration, and operation simple and convenient. PPLA, PPLB, PPLZ emulations available. Barcode is a machine readable language. Barcode can be printed on the label, so this is called as the barcode label. Barcode is printed by barcode printer. And the information present in the barcode is read by barcode scanner. Sometimes companies need to purchase the printer to print the barcodes. So Label OR BARCODE PRINTERS are ideal one, which is useful for any one. Pricing products: This is the well known use of the barcodes on labels and stores. Barcodes are used on the products to know the price and other information about products. When a scanner scans the barcode on the label, the price will be installed into the cash register without any need to do the manual work to enter the price. ID cards: Barcodes are used on ID cards as well. Through a swipe card system, such cards can be scanned. Barcodes on id cards are used to record the employees clocking on and clocking off times, and it also useful to provide security measure to the building. Patient identification: Barcode labels are used in hospitals to store the information about the patients and their medication details. Barcodes labels are kept on the wristbands which are worn by patients and documents of patients. Documents: Barcode labels are used or kept on the different documents which are returned to the government offices or other organizations. Date and time of the document return and information about who completed such documents are recorded by using such labels. Thus, barcode labels are used for many purposes. Because of this the popularity of the barcodes and barcode labels are increasing day by day. These labels work in all Citizen, Zebra, Printronix,Sato, Intermec, Datamax and many other branded printers. Just select the label size, core size and outer diameter size for your printer. If you don’t see your size, give us a call and we will match the thermal transfer labels that meet your need. Direct thermal labels do NOT use a ribbon. Direct thermal barcode labels react to the heat from the print head. This sensitivity to heat makes the label life less than a thermal transfer label. These labels will fade over time. The coating on the direct thermal labels today do make them a little less sensitive to sun light though. Cognitive manufactures printers and high quality Barcode Labels for use in their industrial, desktop, direct thermal, thermal transfer and portable printers. Select your label size and material below. If you do not see your size, give us a call. We will be happy to match the right size and material for your Cognitive label needs. In Indian barcode Dwarka sector 12 Delhi is best manufactures labels to the exact specification for these printers. We have the largest selection of laser and inkjet adhesive labels. Our standard self adhesive label comes with permanent adhesive on 8.5 x 11″ sheets and a peel off liner. 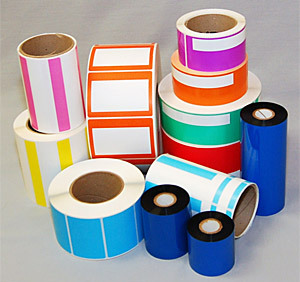 We also offer adhesive labels in a wide variety of colors and materials. Additionally, we carry a REMOVABLE ADHESIVE Labels that can be repositioned or removed with little-to-no adhesive residue left behind. Today there are numerous options when expect the anti-counterfeit solution. The first point to realize is that nothing is tamper evident labels or tamper resistant. If someone wants to tamper with a product they will be able to. Tamper evident labels and Security tape come into play by providing tamper evidence, or an indication that something has been tampered with. This tamper evident labels tamper evidence or tamper indication is achieved with the aid of aggressive adhesives and materials. Removable Labels allow the user to remove or reposition the label without leaving a sticky residue. The durable polyester label easily conforms to radius surfaces and is ideal for reusable shipping containers, inventory shelving, work-in-process applications or any other applications where items are subjected to repeat labeling. Removable Labels can be printed in one or two of our standard colors and include a company logo or stylized type. The barcode VAULT 00024 Jewelry is a thermal transfer, white, polypropylene, label with a permanent acrylic adhesive. Offers excellent durability and chemical resistance. Suggested applications include, jewelry tags and ring labels. Freezer Labels and Frozen Surface Labels – guarantee you high quality text or barcode images easily legible after being stored in conditions ranging from -20°c right through to -80°c. Well you no longer have to imagine, with Brady’s durable range of materials designed to withstand freezer storage environments tracking samples is now made a whole lot easier. Labels are chemically resistant and adhere to all plastics without cracking, peeling, or degrading. Indian Barcode Corporation is the biggest labels and ribbon manufacturer in Delhi NCR. Thermal transfer ribbons are classified in three categories: Wax, Wax/Resin and Resin. Each type has a range of subtypes like Economy and Premium Ribbons. Indian Barcode Corporation is the biggest manufacturer of Zebra Thermal Transfer Ribbons in India. Thermal Transfer Printing is done with two types of print heads Flat-Type print heads and Near Edge (True Edge, Corner Edge) print heads. Ribbons used for these two thermal transfer printing technologies are different though the types may be the same. The least expensive of all thermal transfer ribbons. Wax ribbons have a high percentage of wax based substance in the colourant. Most wax ribbons are made with a single colourant layer. Since waxes have lower melting points than resin substances, printing can be done at lower heat settings or energy levels. Wax ribbons are suitable for printing on uncoated or matte coated surfaces. Wax/Resin Ribbons are a combination of wax and resin based colourant substances in which resin substances hold a greater percentage. Wax/Resin Ribbons are made of two or more layers. Resin substances have a higher melting point thus increasing the melting point of the ribbon. Wax/Resin Ribbons can be used with glossy or smooth surfaces, synthetic materials. Printing speeds of 16 inches per second can be achieved with Wax/Resin Ribbons. Wax / Resin ribbons can be used for all purposes where wax ribbons are used but where there is a chance of abrasion or scratch due to contact. Wax/Resin ribbons are slightly expensive then wax ribbons. Resin Ribbons contain the highest percentage of resin materials. Printing with resin ribbons is done at high energy levels or heat settings as resins have a high melting point. Low print speeds can be achieved due to the high energy levels required for printing. Resin Ribbons are best suited for use with textile apparel or garment labels like (taffeta/satin), high gloss coated materials like polyesters, polyolefin, destructible vinyl, warranty void labels, labels which are to be exposed to harsh environments like chemical drum labels, medical and pharmaceutical labelling, as well as industrial and automotive applications. Resin ribbons are the most expensive of thermal transfer ribbons. Labels can be printed using several differing printing technologies. However, one of the most popular methods is called thermal transfer printing which uses roll-form labels and printing ribbons. This technology requires lower heat settings to transfer a printed image than some printing methods such as a laser toner process. For this reason, you have the widest variety of paper and film label materials at your disposal, including an extensive choice of label adhesives to fit special labelling applications. Indian Barcode Corporation selling Symbol DS4308 2D barcode scanners in India. The Zebra DS4308 Barcode scanner is a feature-rich next generation 2D imager that resets the bar for scanning performance, scanning range, versatility and ease of-use. Workers can capture virtually any barcode faster than ever, whether it is displayed on a smartphone, tablet or computer or printed on a label – even if it is scratched, damaged or dirty. Its small and lightweight design offers the ergonomics your workers need for all day comfort in the most scan intensive jobs. Indian Barcode Corporation India’s biggest barcode scanners dealer ,Distributor & supplier in India. A variety of models meet a wide range of business needs – from the Point-of-sale in a retail store to the light industrial manufacturing production line. ZEBRA DS4308 is earlier known as symbol ds 4308 both are one and the same thing , Regardless of which model you choose, you get one powerful scanner that does the job of two. The standard Range (SR) model offers an extraordinary range, eliminating the need to purchase separate standard and extended range scanners. Indian Barcode Corporation is selling DS 4308 this high density (HD) model scans standard barcodes as well as the tiny, dense barcodes commonly found on jewelry tags, consumer electronics and electronic components – eliminating the need to purchase separate standard and high density specialty scanners. And driver’s license parsing can be added to either model. The result– An extraordinary feature set and an extraordinary value. Symbol ds 4308 Scan any 1D or 2D bar code farther and faster with next generation scanning technology. Electrical Safety UL60950-1 2nd ed, CSA C22.2 No. 60950-1 2nd ed, EN60950-1/IEC60950-1 2nd ed. Enjoy easy access to fast repair and expert support with Service from the Start; add “next business day” replacement with Advanced Exchange. When customers are looking for extraordinary flexibility and performance in a handheld scanner. the next-generation scanning technology in the DS4308-SR/DL/HD delivers. Its truly extraordinary range does the job of two scanners, allowing users to scan nearer and farther than any other scanner in its class. Workers can scan virtually any barcode—1D or 2D, electronic or printed on paper labels or plastic cards, even if the barcode is dirty, scratched, or poorly printed. For workers who need to capture more than barcodes, the megapixel engine enables the capture of crystal clear photos, signatures, and more accurate OCR data. Adjustable beeper volume and frequency allows users to tailor the ZEBRA Symbol DS4308-SR/DL/HD to meet specific environmental needs, from a soft tone that won’t disturb shoppers in a quiet boutique store to a louder tone that workers in a manufacturing plant can easily hear. Deployment couldn’t be easier. Smart auto-host detect cables automatically determine which interface is attached, eliminating the need to scan numerous barcodes to properly configure. With PRZM Intelligent Imaging inside, users can capture barcodes as fast as they can pull the scan trigger. That means shorter lines, shorter wait times, and more sales. The zebra DS4308-SR/DL/HD is a new class of scanner for a new world of barcodes. Handphone : 0-9810822688 , 0-9717122688. Citizen printers are fast, tough and easy to use. Our machines are designed to deliver optimum performance, functionality and reliability, bringing you the best possible return on investment. We are at the leading edge of printer design and build our machines with features that offer hassle-free, high quality output with minimal maintenance. Throughout our range you will find printers that are smaller, faster and more reliable than any competing model on the market. Our new generation of energy efficient printers cut costs and save waste, and all our latest label, POS and mobile printers are backed by outstanding customer support services, giving you total peace of mind. The qualities of Citizen Printers can be summed up in three words: performance, precision, perfection. Our desktop range is designed to provide simple, low-cost, high quality printing and the best-in-class CL-S631 offers the finest resolution, providing 300 dpi for the reproduction of logos, pictures and EAN-compliant barcodes. The CL-S631 is supplied as standard with Cross-Emulation technology with both Zebra and Data max emulations, plus a range of connectivity options including USB, Ethernet and Wi-Fi. The powerful CLP-631 provides users with unparalleled features in the desktop thermal printer class. With crisp 300 dpi printing for images or fine text and an unprecedented 360-meter ribbon for greater productivity and reduced downtime the CLP-631 is a high-performance printer built for the desktop environment. Citizen’s unique metal Hi-Lift mechanism allows easy access for loading of media and/or ribbons and the adjustable media sensor can handle a wide variety of label configurations including standard and pediatric medical wristbands. The powerful on-board 32 Bit RISC processor delivers exceptional throughput and fast first label out. The CLP-631 comes standard with internal parallel, serial, and USB interfaces. Optional Ethernet and Wi-Fi interfaces are also available. Front exit – prevents damage from moisture or foreign objects. Variable paper width – 0.5 inches (12.5 mm) – 4.6 inches (118.1 mm). Durable design – Citizen’s proven Hi-Lift™ all-metal mechanism. Paper thickness up to 0.250mm. Fast print out – 4 inches per second (100 mm per second). Large media capacity – holds rolls up to 5 inches (127 mm). Wide range of ribbon options – Uses up to 360 meters inside and outside wound ribbons. Low space requirement – integrated power supply enables clean work station. 3600 labels per hour (continuous run). 2880 labels per day (10% running, 8 hours / day). Internal 5-inch roll, 1-inch core. Typically 750 labels per roll. Continuous running would use a roll every 12.5 minutes. External 8-inch roll, 3-inch core = 1500 labels/roll. Continuous running uses a roll every 25 minutes. Thermal Print Head for Citizen CL-S631 Barcode Printer. Printing Method —-Thermal Transfer / Direct Thermal. The ribbon use in Citizen 631 is Wax, Wax-resin or Resin. The length of ribbon 1182/360m. Variable paper width – 1 inch (25.4 mm) – 4.6 inches (118.1 mm). Windows XP, Vista, 7 and 8. Capacity for ribbons up to 450 meters. Optional reminder (CL-S700R) and peeler. Ultra fast print out – up to 250mm per second (10 inches per second). Backlight LCD control panel for easy configuration. Very large media capacity – holds rolls up to 8 inches (200 mm). Wide range of ribbon options – Uses up to 450 meters inside and outside wound ribbons. Windows Server 2003, 2008R2 and 2012. Cross-Emulation™ – Automatically switch between Zebra® ZPL® and Datamax®. Part of the CL-S700 family of printers, the CL-S703 delivers an outstanding 300dpi resolution for pin-sharp printing. Tough, robust and built to withstand the rigors of most industrial, warehouse and logistics environments, the CL-S703 is built to provide years of trouble-free use. High speed (200 mm per second / 8 inches per second). Thermal and thermal transfer options. Extras include reminder (CL-S703R) and peeler. The dynamic and robust Citizen CLP-8301 Thermal Transfer printer features high Performance 300 DPI resolution at 4inches per second through put speed Roll fed(Up to 8 inches),continues of fan fold media may be printed at widths up to 8.6 inches. The Citizen CLP-8301 can also print on 6 inch media for those narrower application requirements. The heavy duty metal case provides durability and user friendly quick loading of label media and ribbons (wax, wax-resin or resin).For extended compatibility, the CLP-8301 printer features datamax industry standard emulations along with Citizen’s own powerful command language to allow users to take advantage of the extra functionality of this high resolution printer. The Citizen CLP-8301 features a unique modular design that is flexible and expandable allowing for a wide range of interfaces and accessories. Standard interfaces include a parallel and serial port (up to 115KBPS), optional 1284 parallel and universal serial bus. The CL-S621 offers a reliable, easily integrated industrial desktop printing solution. These units are supplied as standard with on-board ZPL® and Datamax® emulations plus BASIC Interpreter programming support, offering maximum flexibility and easy compatibility with other applications. Handles a range of media types, including specialized labels and wristbands. Powerful on-board 32 bit processor for fast output. 16Mb of RAM and 4Mb of flash. BASIC Interpreter – for data stream processing. Fast print out – 6 inches per second (150 mm per second). Indian Barcode Corporation (http://www.indianbarcode.com/)deals in CITIZEN printer and ribbons. For any query and suggestion regarding CITIZEN printer call us on 9717122688 or write us at gm@indianbarcode.com. Office Address:-S-4, Plot No-7, Pankaj Plaza, near metro station-12, Dwarka, New Delhi-110078(India). Indian barcode Corporation Is Providing the Zebra Printers Servicing and care in india. we are the Labels And Ribbon manufacturer for Zebra Barcode Printers, we also official Distributer Partner of Zebra in delhi. if you are searching zebra barcode printer service center in india, contact us. We do Support to our customers via remotely or visit to our office, we are the most reliable Supplier of Zebra Barcode Printers. we are provide the full ssupport related to Zebra Printers. we suggest Printers to customers as customer required. Our technical expert team work and support the zebra Printer repair service. we do repairing and servicing to customers. Most Common and Populer Zebra Barcode Printers models that are used in barcode Industries. Indian barcode Corporation is the Manufacturer of barcode Labels and Ribbons for Zebra Printers and ofer best price on barcode printers labels and Ribbons to our customers. Call us for technical or sales support of Zebra Printers. Honeywell Xenon 1900, Honeywell’s sixth-generation of area-imaging technology, is redefining the standard for hand-held scanners. Featuring a custom sensor that is optimized for bar code scanning, Xenon 1900 offers industry-leading performance and reliability for a wide variety of applications that require the versatility of area-imaging technology. Honeywell Voyager™ 1202g hand-held laser barcode scanner incorporates the freedom of Bluetooth® wireless technology and offers a field-replaceable battery that can be quickly and easily exchanged. The 1202g single-line wireless scanner delivers the aggressive linear barcode scanning that users have come to expect from the world-renowned Voyager family of scanners. Read even the poorest quality barcodes with advanced laser scanning technology that only Honeywell can deliver. Voyager 1202g Wireless Single-Line Laser Scanner Features and Benefits Bluetooth Wireless Technology: Facilitates scanning of all standard 1D bar codes 10 meters (33 feet) or more away from the base, depending on the user’s environment. Honeywell Eclipse is a low cost laser-based alternative to CCD scanners. Code Gate: Ideal for menu scanning applications Code Sense: Automatically switches from pulse mode to continuous beaming when a bar code is detected Power link cables: Uses the same user-replaceable cables and power supplies as Voyager, Orbit and Cubit Flash ROM: Update firmware from any PC via Metro Set 2 software provided by Metro logic OPOS and JPOS system compatible: Easily adaptable to any end-user system environment. Handheld laser scanner, 72 lines scans per second, scan angel Horizontal 50. Honeywell Hyperion 1300g linear-imaging barcode scanner features an ideal balance of performance, best-in-class durability and ergonomics to provide years of hassle-free scanning, especially in scan-intensive or light industrial applications. Fast intuitive reading of 13 mil barcodes out to 18 inches (457 mm), as well as reading of high density barcodes as small as 3 mil is both enabled in a single linear image, eliminating the need to purchase specialty scanners. Get the most out of the Hyperion linear image with compatible Remote Mastermind scanning management software.